Albion winger Anthony Knockaert says his one dream right now is to help the club get promoted into the Premier League. It has been an emotional time for the 25-year-old French winger after his father, Patrick, died five weeks ago. 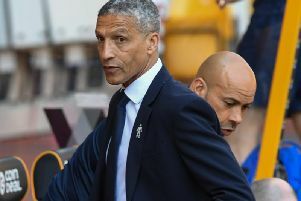 Knockaert has praised the club for all their support, which included several members of the first-team squad travelling to France to support their team-mate at the funeral. Speaking to the press this week ahead of tonight’s match with Leeds, Knockaert said: “If you ask me about one dream I have now, it’s to get promoted with this club just for what they have done for me. “If I didn’t have the support like this from the club, it would be really hard for me. “Brighton & Hove Albion Football Club is something that I will never forget. If I could play here all my life, I will be happy because what they showed towards me was something really nice and you can’t fault what they did for me. Knockaert is now aiming to hit top form again and said: “You could see in the last two games I started that I wasn’t at my best. That’s just a normal thing because it was physically hard and mentally it was the toughest moment of my life.